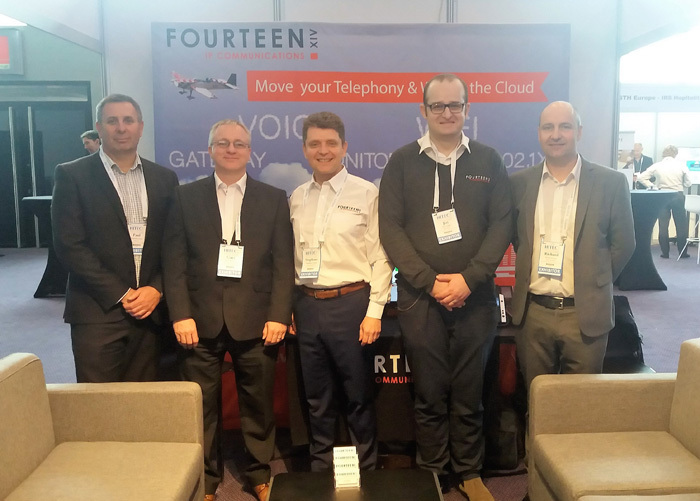 Members of the Fourteen IP European team enjoyed a busy few days at the first HITEC Europe event in Amsterdam. With in the region of 1000 delegates registered for the event, it has already established itself as the largest hospitality exhibition in Europe. A chance to catch up with existing customers and chat to new contacts in the hospitality sector the team experienced a lot of interest in the Evolution Voice Cloud Telephony Service for Hotels, together with the Guest Internet Access and Guest Engagement. The attached picture from the show features Paul, Gary, Stephane, Jiri and Richard from Fourteen IP (left to right).